While most of us pride ourselves on our dutiful home recycling now that the Council comes and picks it up it seems that in the work place Londoners have less of a conscience. About half of us admitted to not thinking twice about chucking out forests of paper, mindlessly wasting disposable cups and leaving lights and machines on 24/7. Mostly because we don't have to pay the bills at the end of the day. The survey of workers over 3 days at Holborn, Embankment and Bank stations was conducted as a part of Working Buildings Week which includes the not normally headline grabbing Facilities Management and Estates Event taking place on 10 and 11th October at Olympia. They'll be hosting Green Day which unfortunately doesn't feature the American idiot band but a programme of environmental awareness seminars to help working buildings and their oft overlooked facilities managers to encourage us all to be more green minded in the workplace. As with the big disposable shopping bag debate, making workplaces more sustainable is all about changing mindsets and everyday behaviour. London needs to see beyond the immediate convenience of corporately provided resources to the wider environmental impact of our habitual wastefulness and let the mantra "reduce, reuse, recycle" into our daily grind. 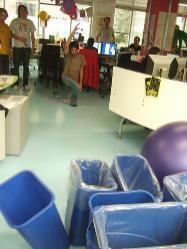 Perhaps a compulsory game of Office Recycle Bin Bowling could be a useful awareness raising tool for us all? We'll be waiting to see if it comes up in the Working Buildings Week Innovation Awards. Image courtesy of wetwebwork's Flickrstream.